San Francisco Bay Area folks will probably be familiar with the institution that is Bucks of Woodside, a place where one can consume copious quantities of food of all kinds, humorously detailed on the menu that also doubles as a magazine supplement! 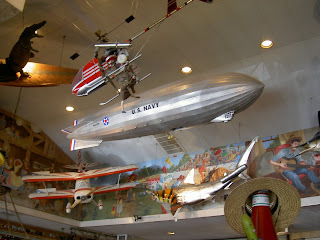 Bucks is also known for its decor, which comprises an eclectic mix of collectibles, models and the downright strange, arranged over every square inch of wall space. Given my previous post it was not surprising to spot the Macon hanging in the ceiling, among the surfing crocodile, Sokol KV2 spacesuit and assorted other models. If I find out some history about this model, I'll add a note. Its a large one and rather well detailed, including the sparrowhawk hanging from the trapeze below it. If you're in the Bay, aside from visiting Bucks, take a peek at the Moffett Field Historical Society Museum where they have lots of great stuff about the Macon and Sparrowhawks.